Booming hot tub and swim spa manufacturer Coast Spas has enhanced its campaigning credentials for pedigree production following the appointment of Executive Vice President of Operations Jatinder Sidhu to the US Technical Advisory Group. As part of his involvement with the US Technical Advisory Group (USTAG for IEC/TC61), Jatinder, who is known as JT, will now have the additional role of representing the hot tub industry globally in overseeing standards for consumer goods, which specifically relate to hot tubs and spas. JT, pictured, and pedigree Canadian manufacturer and multiple WhatSpa? and WhatSwimSpa? Best Buy Award-winning Coast Spas have a long history of in-depth involvement in ensuring that the hot tub and swim spa industry are held to a high standard in their production of consumer goods. This is reflected by the fact that Coast Spas now has a representative committee member in the following organisations: BSI (British Standards Institute), CEN (European Committee for Standardization), DIN (Deutsches Institut für Normung/or German Institute of Standardization), CSA (Canadian Standards Association), APSP-IHTA (Association of Pool and Spa Professionals – International Hot Tub Association), NSF (National Swimming Pool Foundation – Salt Water Task Group) ANSI (American National Standards Institute) – APSP 14 and now the US Technical Advisory Group (USTAG) for IEC/TC61. Due to his extensive involvement in these organisations and a plethora of experience and knowledge, JT was selected to the USTAG leadership position that will advocate high standards for consumer safety for all brands of hot tubs and swim spas worldwide. Endorsed by the APSP, the commitment of Coast Spas and JT is to raise the bar for manufacturing standards and ensure the protection of consumers around the globe. The appointment follows a bumper crop of new model and enhancement launches this year by Coast Spas, which has gained 2017 WhatSpa? Best Buy Awards for its Regency Spas Baroness, Regency Spas Grand Duke, Regency Spas Prince, Coast Spas Luxury Cascade II, and imposing Coast Spas Luxury Mirage Curve; as well as 2017 WhatSwimSpa? Best Buy Awards for its Regency Spas Emperor, Wellness II Lounger Play, Wellness Infinity Ultra, and twin chamber Wellnes IV Dual Temp models. Thanks to the involvement of JT and Coast Spas the standards for hot tubs and spas in Europe have been under close scrutiny and are now set to be improved to help promote quality manufactured products. Currently, the domestic spa and hot tub standard (EN 17125) is now available for public consultation, known as a ‘CEN Public Enquiry’, until August 3 ahead of the next meeting of the Working Group that is developing this standard (TC 402 WG4), which is scheduled for September 12 to 14 in Berlin. The wet leisure industry has also been informed that there are also proposed revisions to some of the standards for domestic pool construction and installation (the EN 16582 series) and also to the domestic pool water filtration, circulation and treatment standards (the EN 16713 series). The comments will be discussed at the next meeting of the relevant CEN Technical Committee (TC 402) on September 5 in Helsinki. “The first official in-person meeting of technical group TC 402 WG4 was held in Berlin on December 17, 2014 at the head office of German (DIN) Institute of Standardisation followed by three more meetings with Coast Spas in attendance,” said JT. “My participation on this project is through BSI membership as an expert, along with two other experts from North America, and we have been working with the technical group sharing ideas and thoughts with colleagues in Europe regarding the alignment of key themes in our respective standards with a desire to harmonise standards between our continents. “Standards alignment is important because governments look to standards as the basis for their ordinances and codes. Standards become law, and laws guide manufacturers, builders and retailers in their product choices, building techniques and emphasis. “When standards are harmonised country-to-country, the global industry is bound together by a common language of product expectation. JT has declared that Coast Spas will continue with its commitment to surpass product standards in the future while time runs out for retailers currently promoting products that will not comply with the proposed new global standards. 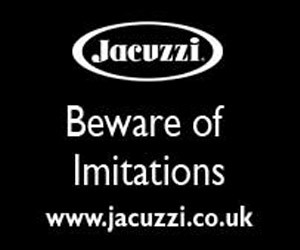 “Product safety is an important consideration in designing of the hot tubs,” said JT. “As a ‘partner in product safety’, Coast Spas is committed to complying with all applicable product safety regulation standards. Following its lavish launch of products at its 20th Anniversary International Dealer Meeting earlier this year, Coast Spas is now promoting a host of new models and is helping its British dealers to boost their sales with dedicated advertising campaigns in the 2017 editions of WhatSpa? and WhatSwimSpa? magazines. As part of its ‘Step up to the Edge’ advertising in WhatSpa? unique features of the Cascade Series are being highlighted to consumers. These include the exclusive 24” lit waterfall for a superior neck and shoulder massage, commercial grade pressurised hydro cyclonic filtration, self-cleaning sweeper jet. Advertising also includes the ‘Experience the Curve Series’ to promote the innovative design features of the Curve Series hot tubs. The new Wellness Infinity Edge design, meanwhile, is also being extensively promoted to consumers and has a dedicated advertising campaign in WhatSwimSpa? to promote its unique infinity edge design, advanced features and immersive swim experience. Filed Under: Manufacturer interviews, News, News & views Tagged With: Coast Spas, hot tub dealers, hot tub standards, WhatSpa?, WhatSwimSpa?